Installment number seven on my year of baking my way through Peter Reinhart's The Bread Baker's Apprentice. Go get some coffee. These breads were three of my favorites from this book. Left: Shaped as Marbled Rye. Right: Shaped as a Spiral Loaf, not all that different, right? I always thought that marbled rye bread was made from two different doughs based on two different flours.. one white rye, one pumpernickel. Wrong. At least in this case, it's just the same dough, with half of it dyed brown with caramel coloring, cocoa, carob, or coffee powder. I didn't have caramel color and didn't know where to find any (I've since run across it at Smart & Final near my house), and didn't want to use cocoa or coffee in my bread. A search on "caramel color" on the internet produced a suggestion to use Gravy Master. Gravy Master? Guess what the top two ingredients are? Caramelized sugar and caramel color... and I already had it in my pantry. So I added a tablespoon of that stuff plus a few drops of AmeriColor gel food color in brown. Look at how contrasty this bread turned out. The dough is 1/3 white rye flour and 2/3 all purpose or clear wheat flour. 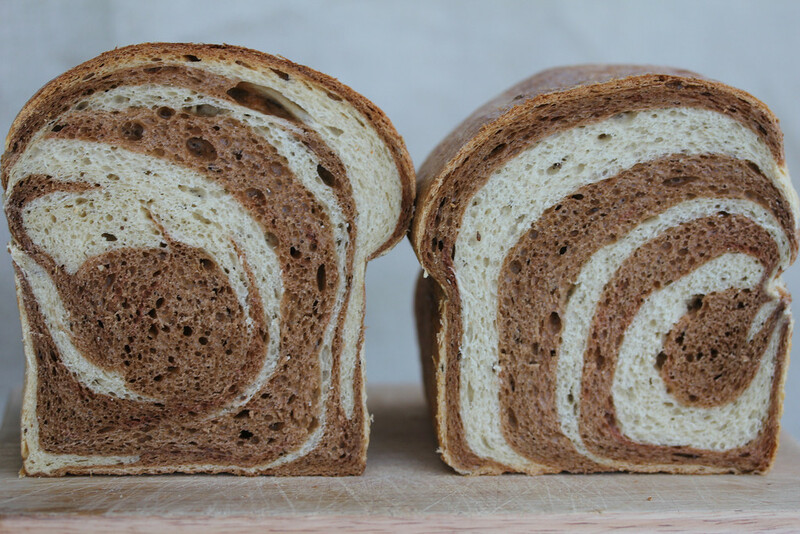 You can use medium rye flour, but you won't get this contrast between the light and dark. I got my white rye from King Arthur Flour. You make two batches of dough and then add one of the darkening ingredients to one of the doughs. You have a few options for shaping. I tried the marbled technique and the spiral technique. For the marbled bread, you divide the dough up into balls and them clump them together and then shape your loaf. For the spiral loaf, you create four layers of alternating colors, and roll them into a spiral. As you can see, they pretty much exploded in the oven. For those of you who don't like rye bread, this bread does not have that store bought rye taste that you think of when you imagine rye bread. It is very mild and the dough behaved like bread dough. I would definitely make this bread again. Google BBA Challenge #19 Marbled Rye Bread to see other bakers' experiences with this recipe. Every time Peter Reinhart writes a bread book, he includes a recipe for this multi-grain bread, also called Struan. In fact, this is the bread that lured me into the BBA Challenge. This bread starts with a cornmeal, rolled oats, and wheat bran soaker. It also includes bread flour, cooked brown rice, brown sugar and honey, and buttermilk. It is pretty incredible. 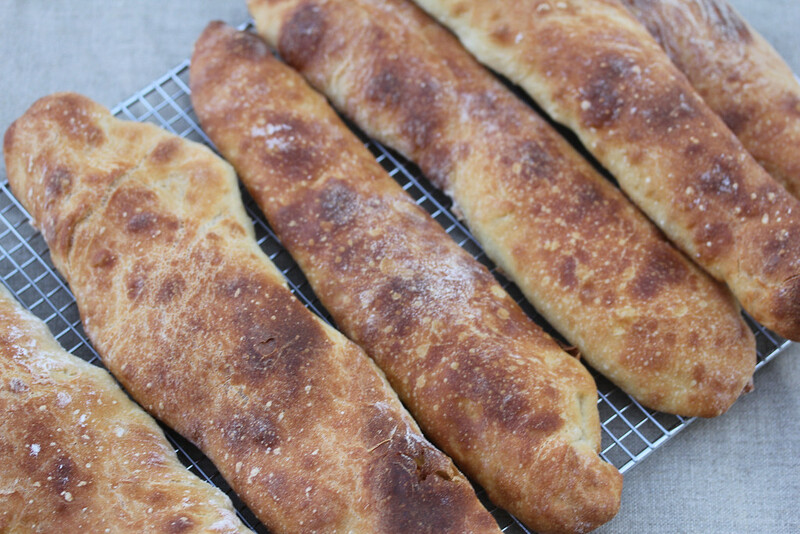 I highly recommend making this bread. Awesome toast. I've made it twice, even with the "pressure" to finish baking my way through this book. Try it. You'll love it. 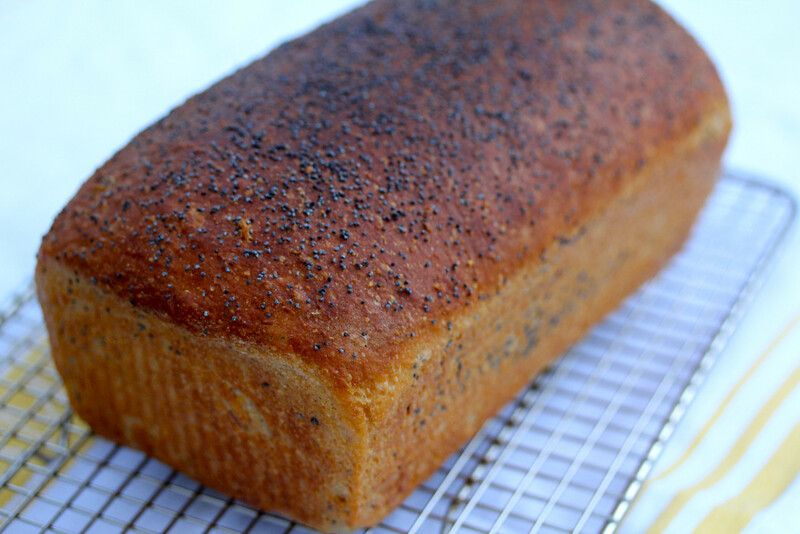 Google BBA Challenge #20 Multigrain Bread Extraordinaire for more bakers' experiences with this recipe. 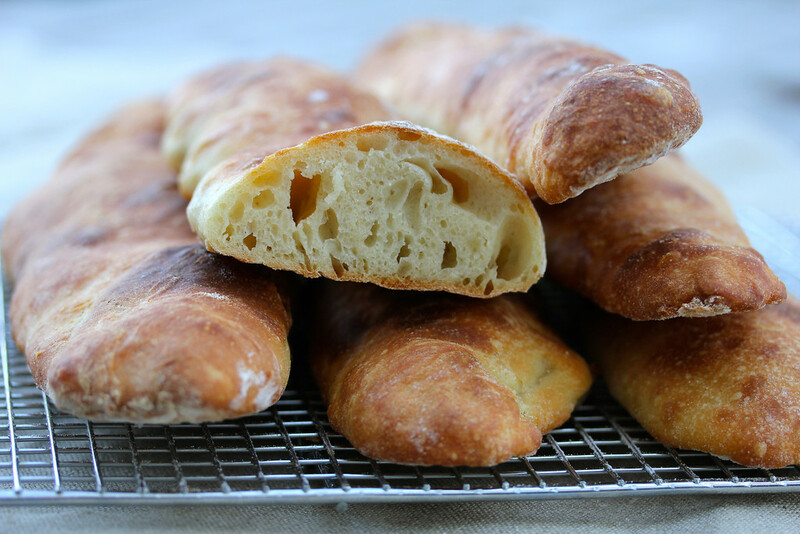 The amazing thing about bread (yes, I know I've said this before) is that you can take the exact same ingredients, and depending upon how you treat them, you get completely different results. Variables include ratios, and also the fermentation time, and in this case, fermentation temperature. This dough is cold fermented, and uses ice water. This method creates an amazing flavor. 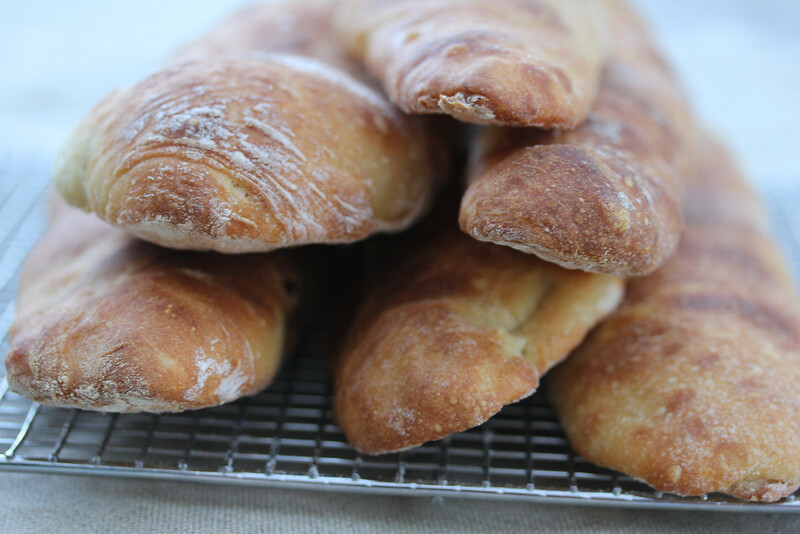 In his book, Artisan Breads Every Day, Peter used this dough to create an amazing Ciabatta. I speak from experience. This dough is very, very wet. And forget slashing it. You create these strips of dough, place them on parchment, and bake them on a stone. Go with it. You will be pleased. You will feel like a pro. 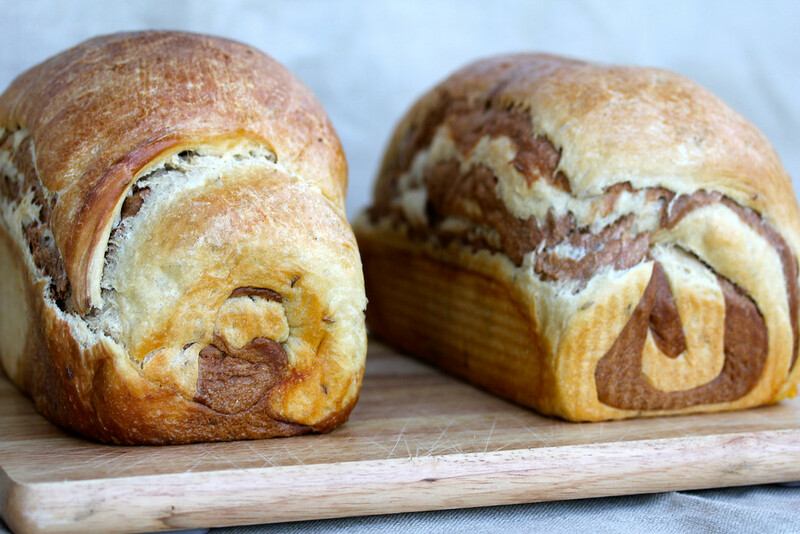 To see other blogger's experiences with this bread, Google BBA Challenge #21 Pain a l'Ancienne. And get the book! Or borrow it from the library. It's amazing. Thank you Heather! You should definitely give it a try.